Elizabeth Kramarck of Delaware has shared this clever idea to raise funds for Habitat for Humanity. 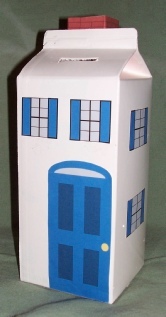 A milk carton is re-designed to resemble a house with a “chimney” for depositing coins or bills. As the funds collected reach a certain amount, a window or door is added to the carton. Or even a new “house” is built. Elizabeth’s club, numbering 28 members, has raised $99 in just two meetings. She hopes to have a city block soon! Previous Article Previous Article: 2016 National Garden Clubs, Inc.